It may be cold outside but that is a good thing for outdoor fun! The outdoor rink is officially ready to go at Wayne Gretzky Estates in Niagara -on-the-Lake where you can bring your skates or rent them to take a spin while enjoying the great outdoor ambiance. $5 per person for Skating and $10 per person for Skate Rentals, plus taxes. Skate rentals are available on a first-come, first-served basis in adult and children’s sizes. No reservations available. No.99 Club members receive half price discounts. ALSO: Relax on The Whisky Bar Patio (with heaters) where wine & cocktails are served up every day of the week (non-alcoholic beverages available, too) as well as a winter menu from Friday to Sunday. HOLIDAY RINK HOURS:The rink will be open DAILY December 17-January 8 from 11:30am-6pm (and 9pm on Saturdays) with the exception of December 25 and January 1 when the Winery & Distillery are closed. 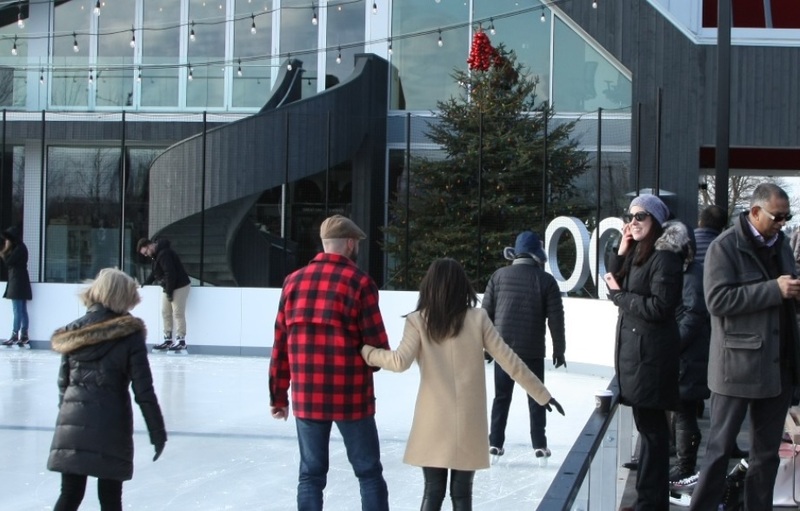 PLEASE NOTE: The outdoor skating rink is weather dependent, and is subject to close at any time due to warmer weather or inclement weather. DJ Saturdays– Join in the backyard fun on Saturday evenings from 5pm to 9pm, starting December 22, for an outdoor party with a live DJ spinning tunes, skating, delicious food and craft cocktails.